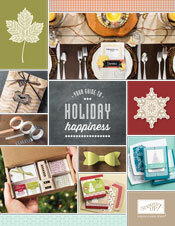 The new Holiday catalog was released on August 1st, so feel free to browse the catalog online. This catalog is in a different format from previous catalogs. All of the fun samples and projects are in the front of the book, and the pictures of the items are in the back. There is a lot of cross references for page numbers, so don't worry. Also there is a new interactive app called Layar, so make sure you download the app on your smartphone for added help and tips. If you would like a copy of the catalog and do not have a current relationship with another demo, EMAIL ME for your free copy. I would love to be your demo. If you have not joined paper pumpkin, now is the time to do it. You can get $10 of a month for two months with the PUMPKINDEAL promo. Go to the Paper Pumpkin website now to sign up. If you sign up before August 10th, you will receive your first subscription in August. Please choose me, Sandie Conner, zip code 28115 for your demo, and you will receive a free adhesive of your choice mailed to you FREE. Just email me after you join, and I will send it right out. Thinlits are here! They've been called flip cards, flip flop cards, swing cards, and more-but they have always been a bit tricky to create. Not anymore! Our amazing new Thinlits Card Dies cut and score to create a card that flips in just one step. These new card dies come with extra die pieces that have versatile designs, so you can use them on other projects, not just flip cards. (The Circle Card Thinlits Die comes with 10 total pieces; the Label Card Thinlits Die comes with nine total pieces.) Check out this video for more info! I would love for you to join my team, I have a wonderful group that I belong to, and all perks would be open for you as well. EMAIL ME today for more info. That's all for now, come back tomorrow for my Stampin' Royalty card, see you soon!